Today was our second in Nagoya and we had planned a day trip down to the Ise area of the Shima Peninsula. This area is most famous for the Ise Shrines which are the most sacred Shinto shrines in the entire world. Apart from Ise the rest of the peninsula is also quite interesting and contains a couple of famous bays and some theme parks. The town of Ise is located about an hour and a half train ride away (plus ¥490 yen with the rail pass) from Nagoya and a little investigation revealed that it was going to be a pretty gloomy day weather wise down. We also thought that we’d very much like to visit the other attractions on the peninsula but realised we wouldn't be able to fit it all into one day and that it would be much easier to do with a car. On the other hand, Kyoto was located only thirty eight minutes away and we were promised mostly clear weather. Furthermore, we had planned to visit the Arashiyama area of Kyoto during our last day in Japan which meant attractions were already detailed in the Japan Book. Finally, if we went there today we'd have the whole rest of our trip to figure out what to do on the last day. We were not forgetting the Shima Peninsula, but rather saving it for another trip, where we could perhaps stay a night or two and rent a car. This morning we awoke to our first hotel that didn’t serve breakfast and would therefore have to go out and forage for ourselves. Nagoya station wasn't too far from our hotel and we managed to find some food each at two different little restaurants. Kate got Kishimen which is one of Nagoya’s local specialities and is basically Udon but the noodles are broad and flat. The broth’s taste is appropriately somewhere between Kanto and Kansai and the dish traditionally contains dried bonito, spinach, fish paste, and bean curd. Since the menu and shop was all in Japanese I went in to order with her and then went next door to get some egg, toast and milk. The Kishimen was served cold and was quite salty- Kate enjoyed it. At first she was worried that the mince on top was raw but it turned out to be well cooked chicken mince. Since we were already at Nagoya Station, after finishing breakfast I looked up the next Shinkansen on my phone and a couple of minutes later we were on our way in the unreserved section. During our short ride I realised that although we already had Arashiyama area of Kyoto in the Japan book, it was in volume two which we had left back at the hotel! Luckily though I had a digital copy stored on dropbox and was able to download and open it on my phone before we arrived. I'd just have to be careful about the battery! To get to Sagaarashiyama Station Hyperdia suggested that we catch a 09:57 JR Sagano Line service after arriving at Kyoto Station at 09:34. I thought this seemed like quite a long transfer time and had a look at the interval timetable. Sure enough, there was a 09:38 JR Sagano line which would get us to Arashiyama twenty minutes earlier. Hyperdia actually takes into account the time it takes to transfer between platforms so this meant that it didn't think four minutes would be enough. We disagreed, we could make it! As we pulled up to our platform we were all packed up and ready to dash! We needed to go from track 14 to 32 which doesn't sound like a whole lot but actually turned out to be a huge distance! We sprinted as fast as we could and only just managed to dart into our train after an exhausting four minutes dodging our way through the station. We proved that you can beat Hyperdia though! A quarter of an hour later we arrived at Sagaarashiyama Station and had a quick look around inside. We were mainly hoping for some information we could use instead of the Japan Book (on my phone) and managed to find a rack of pamphlets- although the only maps were in Japanese. Looking around outside the station we found the scenic railway’s terminal station- that was something we wanted to do! Since it travels off to a different area though we decided it would be best to catch it once we were finished with everything else in Arashiyama at the end of the day. We did though have a look inside the station where we found a few shops and a train diorama. A hundred yen granted me the power to control one of the trains! Sadly it turned out to not be as fun as it looked. One last thing of note was that there were a few rental bicycle places around the stations; though we didn’t hire one, it would be a fun way to explore the area. So, on to the sights! First up was Tenryūji (天龍寺= heaven + dragon + temple) which is a famous temple complex located about a kilometres walk away to the south west. The streets we walked along were pretty quiet though the shops we passed were open; for Japan it was still pretty early in the morning. UNESCO world heritage listed Tenryūji is the greatest of Kyoto's Zen temples and the most important temple in the Arashiyama area. The complex was constructed in 1339 by Ashikaga Takauji and dedicated to the recently deceased emperor in an attempt to appease his spirits, as the two allies had become enemies in a power struggle over Japan. Due to the usual wars and fires the majority of Tenryūji's buildings are only around one hundred years old though the garden has somehow managed to survive the last seven centuries in its original form. Upon arriving we found the main temple area and paid the five hundred yen entrance fee. Due to restoration efforts we couldn't actually go into any of the main temple buildings; they will open again in 2014 . This didn't bother us too much though as the main attraction was definitely the enduring garden. The thing to do was to follow the path that led around the garden. It was actually quite crowded and there were a few pulses of school children surging past. One group of these students stopped to asked us a couple of questions and then took a photo of us with them in the garden. This was around the first section which wrapped its way around a large pond that contained a number of koi, as we continued along the path we came to another section that overlooked part of the famous Arashiyama Bamboo Groves. Next we continued up a hill covered in a large amount of lush moss, some ferns and elsewhere in the garden we were able to view many different varieties of flowering plants. There was quite a lot to see and we spent about half an hour walking around and enjoying the scenery. Towards the end we noticed that you could order a meal made from vegetables grown in the garden, though it wasn't yet open. After exiting the garden we walked down the path a bit to another section of Tenryūji which contained the Hattō hall. We paid another, I think, 500 yen to enter and were told to take off our shoes and refrain from taking any photos. Traditionally Hattō roofs contain an image of a dragon to symbolise wisdom and this hall was no exception. Directly above us was a spectacular painting of a dragon whose eyes curiously always seemed to be looking directly at the observer no matter where you stood- if you moved it would follow! We had actually seen a very similar dragon several months ago when we visited Kamakura and in fact, both were painted by the same Nihonga (日本画 = sun + source + picture = Japanese painting) artist Matazō Kayama. The always watching effect is archived by painting one of the eyes directly in the middle of the circular roof so that its relative position never seems to move. Kayama actually passed away only a few years ago and both paintings were created quite recently in the late 1990’s. After leaving the Hattō hall and putting our shoes back on it was time for our next destination- monkeys! To get to the Monkey Park Iwatayama we walked along the streets which by this time had become bustling and lively! We had a look in a couple of interesting little shops which were particularly nice even compared to the rest of Kyoto. One of the shops contained a lot of material shapes and from one of the food stores I bought a cone of the best ice cream I have ever eaten. It was banana flavoured, which is what I always get, and was absolutely amazing! I don't know how or why! It was super delicious! There were also a few other free samples which we enjoyed as well. From the shops we continued over the long and wide Togetsukyo Bridge which crossed the Katsura River. It was a nice river and an alright looking bridge but people seemed to be a bit over enthusiastic about it all and heaps of photos were being taken. After the bridge we passed a music box and mochi shop and continued to the monkey park entrance. The lady at the entrance ticket box where we paid the 550 yen entrance fee spoke English very well! We were given an English pamphlet, and asked to read the instructions explaining how to interact with the monkeys. The basic rules were that we should neither touch, nor eyeball the monkeys and if we wanted to feed them we should only do so from inside the rest house. Also at the entrance area was a little stall from which you could buy a couple of monkey themed souvenirs. 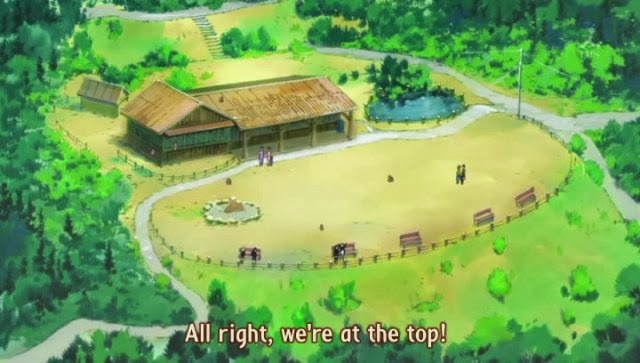 The rest house was located at the top of the hill and so we set off along the trail! As we climbed up we found sign boards with information on the monkeys, quizzes (in Japanese and Engrish) and occasional height markers telling us how far up we had come. It was quite a climb to the top and we became a little hot and sweaty under the glaring sun! As we neared the end of our accent we saw a snake slithering across the path! I have no idea if it was venomous or not but we made sure to give it a wide berth. Finally we reached the top where we found a look out, heaps of monkeys and the rest house. We headed straight for the building as we were both thirsty and were able to buy a bottle each of Aquarius Zero. More importantly though, this was where we could feed the monkeys! There were three types of food for sale, apple pieces, peanuts and... something else. I had a little look around and since most people seemed to have decided upon the healthy apples I thought I'd treat them with some peanuts. Plus I also thought it would be fun to watch the monkeys crack open the shelled nuts . The lady who sold us our goods was friendly and I don't think it was very expensive, probably around 100 yen or so. The feeding area was set up as a cage around the rest house that the monkeys clung to. There were two options you could take to give them the food. The first was to put it down on the window sill and the monkeys would take it from there. The other option was to put the snack on your flat palm and then extend your hand out to the monkeys. They would then reach out and grab it right from your hand! I took for the latter option and it was a lot of fun! They had such cute little hands!!! And unwrapped the peanuts expertly! The monkeys fought a little for position but were not too violent. After they had eaten all of our treats we went outside to have a look at the view. On the way out we used some provided alcohol gel to sanitise our hands. From the viewing area we were able to get a fantastic view of Kyoto city and could even spot Kyoto Tower in the distance. Since we were right outside the rest house there were a few monkeys wandering around though they didn’t pay us too much attention. One thing we did notice about the monkey park was that there seemed to be a greater concentration of foreigners than usual and a significant portion of the anglosphere was covered at the top with us (Australian), some Americans and English people. 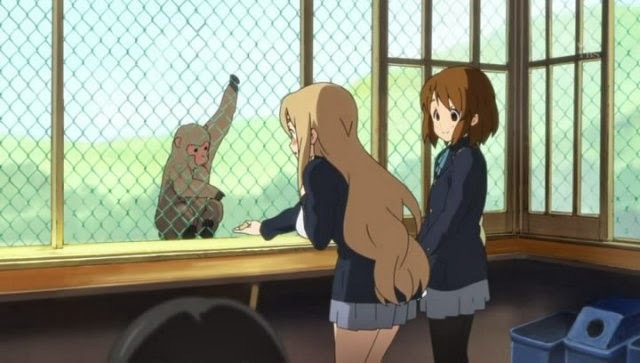 Also- If you've seen the popular tea drinking/music anime K-On, you might recognise the Iwatayama Monkey park! 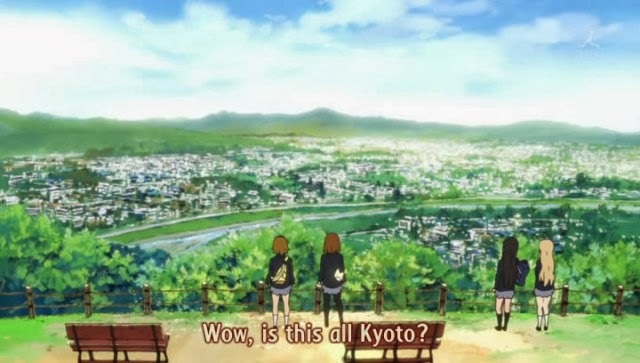 It's the very same place the characters stumbled upon while visiting the Arashiyama during a field trip to Kyoto. Here are some shots from the show! Looking down at the monkey park from above- it's very close to the real thing! While we were getting ready to leave one of the workers called out that it was feeding time and also made a strange noise that caused monkeys to flood down from all directions. Once they had gathered he caused pandemonium by scattering food pellets all over the place. The monkeys were jumping around and chasing him like crazy! Before long though it was over and we headed back down the hill. The route down was different from the one up and along the way we passed some play equipment for the monkeys like slides, monkey (ha!) bars and a see saw. Sadly, none of the equipment was currently being used. It must've rained recently as the path was a little muddy. Kate actually managed to slip on some of this mud and cut both her hand and camera. She also got covered in mud! I had some wet wipes and we used a whole packet to wipe her down and disinfect the wounds. The English people we had seen at the top were further up the path when Kate slipped and offered us some bandaids, which they called "plasters". We thankfully accepted. Once we had finished wiping down and plastering up we encountered one of the employers travelling down on a scooter and he offered to take all our rubbish for us. Once we reached the bottom of the hill we had a look in the mochi (餅) shop where we could try free samples of mochi and flavoured nuts. We both really liked the mochi and I bought some sweet flavoured macadamia nuts. It was more or less lunch time so we crossed back over the Togetsukyo Bridge and found a bunch of foods stalls where we both got some delicious pork and prawn buns. Kate got hers first and after proclaiming how delicious it was I went back over and seriously considered getting one too. While I was looking at the buns the lady told me that the one Kate had got was popular among girls and recommended me a more manly flavour. I asked and the onion situation ruled out the manly flavour but the prawn one was deemed to be safe! So I got one too! It really was super delicious! While eating our treats we walked over to, and then along, the Bamboo Grove. It was quite a narrow path considering that not only were people travelling along it, but so were a couple of taxis! At the end of the bamboo grove we came to a villa owed by famous actor Denjirō Ōkōchi. 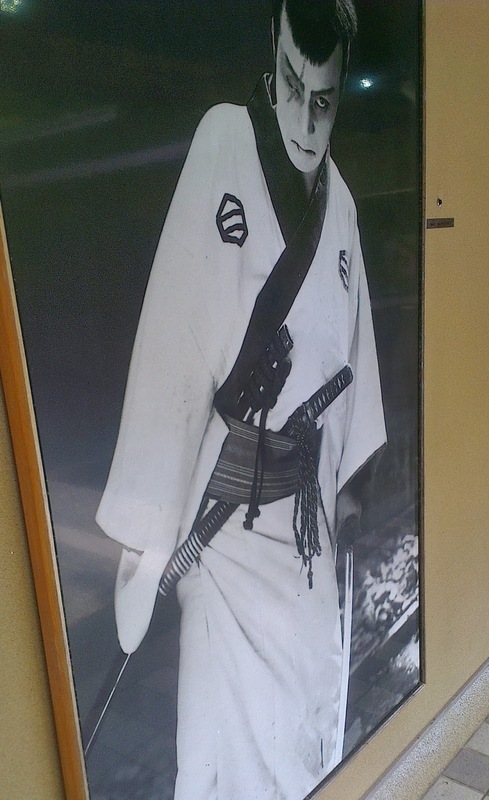 He was born in 1898 and was famous for staring in Jidaigeki, which are period dramas generally set in the Edo period featuring samurai and feudal life. Ōkōchi died in 1962 at the relatively young age of 64 and his house and garden in Kyoto has been preserved and open to the public ever since. The entry fee was a fairly expensive ¥1000 but we didn't mind paying as admission included a snack with some matcha (抹茶) green tea. After paying to enter we first went to the bathroom and then had a look at a small museum that was set up on Ōkōchi's life and theatrical career. There were a few big paintings of him in character and a television or two were set up to play some of his movies. The main feature of the villa though is the extensive garden, however, before we started exploring we first decided to stop and have our tea and snack. There was a little tea room of to the side of the main bath and after we were seated a lady brought out some green tea and a snack. Kate quite liked the tea which was made traditionally with blended leaves- I thought it was ok. I have no idea what the snack was but it was interesting- I guess you could say it was like a biscuit? It wasn't crunchy or sweet though, so maybe not. The garden was quite nice and we spent some time walking up to the top of the hill where we were able to get another good view of Kyoto from a viewing platform. Nearby there was a little rest building that had tatami mat floors though we didn’t' go in because we wanted to keep our shoes on. Next we continued along the path and back down the hill, passing some stone lanterns and such along the way. The garden in general had a lot of moss though there was one shady area that seemed to be especially dedicated to the small plant. After exiting the garden we found that we were near the next station on the Sagano Scenic Train railway line and thought that we ought to have a look and buy a ticket. As stated above we wanted to do the train trip last and after having a look at the times decided to get the last 16:10 train. This meant we had about fifty minutes to quickly explore the other temples in the area! After having a look at our list we decided to first visit Gioji, which is a temple well known for its moss garden at the base of the nearby mountain. It was located about one kilometre away though so we made sure to hurry along! There were lots of signs and maps along the way and Kate had to tell me that we didn't actually need to consult each and every one if we already knew where we were going! Gioji (祇王寺 = God + King + Temple) cost ¥300 to enter and was quite small. It was well worth the visit though as there was an amazing number of mosses to enjoy in the lush little garden. Some of them were really quite tall and interesting while others looked fluffy and soft. It would be a damp bed though as the place was understandably quite moist. Apart from the moss there were also a large number of maple trees stretching up into the sky. In one corner of the garden we also found a number of pots containing the many different moss varieties found in the garden- there really were a lot! I think one of the pots also contained a baby maple tree to complete the collection! As we came around the other side of the garden the sun appeared from behind a cloud and the beams of sunlight shining down through the trees created a magical atmosphere. The next temple we wanted to visit was the Adashino Nenbutsuji Temple, located another 750 meters away. Although we were rushing a little, we passed through the Sagatorimoto preserved street along the way and got to enjoy traditional Machiya (town houses) that have remained as they were back in the Meiji Period (1868-1912). Adashino Nenbutsuji is a Buddhist temple that was founded way back in the year 811 by monk Kōbō-Daishi who, among other accomplishments, is credited with the invention of the kana syllabary (!) and was the founder of Shingon Buddhism. Even before the temple’s foundation, the area was used to abandon bodies of the dead and Kōbō-Daishi created some stone statues to memorialise their souls. Since then, the statues have continued to increase such that there are over eight thousand contained in the temple. Every year, on the 23rd and 24th of August, the statues are lit up by candles as part of the Sento Kuyo ceremony in dedication to those that have passed away. After arriving at Ashino Nebutsuji and paying the ¥500 yen admission ticket we got a little pamphlet and were told not to take any photos. Inside the temple there were a lot of statues to be sure, though some looked like little more than stones with the faces barely perceptible. I'm not sure if this is due to the age of the stones or if it was how they were originally. Actually now that I think about it, I don’t even think they were supposed to have faces in the first place. The sheer number was definitely impressive and imposing at any rate. After the statues we had a little look at some of the buildings around the perimeter but soon returned back out to the main street. We actually really wanted to continue down to the Otagi Nebutsuji Temple, which contains a fewer but still impressive 1200 statues (with faces this time, each with a unique expression) though we unfortunately didn't have enough time to walk the extra twenty minutes there and back. We did however have time enough to visit one of the temples we had passed by earlier before Gioji. Nisonin and Jojakkoji were both located along the same path and after a bit of contemplation we decided upon Nisonin Temple. Nisonin (二尊院 = two + revered + temple) is another old temple founded in year the 834 and currently belongs to the Tendai Buddist sect. It is so named as the temple contains two statues of the Buddha, one of the founding Buddha and another one who has reached enlightenment; both statues are designated as important cultural properties of Japan. Apart from Buddhism, the temple is also famous in the Karuta world as it is said to be the location of the villa belonging to Fujiwara no Teika who was an incredibly influential poet responsible for the creation of the One Hundred Poems by One Hundred Poets (百人一首 Hyakunin Isshu). Every year a game is re-enacted by women in Heian-era (794-1185) clothing. The competitive card game Karuta is played using these poems; one half of the poem is read out and the two competing players attempt to be the first to touch the correct card (containing the second half of the poem) out the 50 randomly selected cards laid out before them. To be a successful player not only must you memorise all the poems, but you also have to have excellent hearing and lightning reflexes as many cards can be taken the instant the first syllable is read. During tournaments endurance is incredibly important as you will need to play for around 8-10 hours in order to win, not including breaks. If you're not playing competitively, Karuta can also be a much more relaxing memory type game. Anyway, we really didn't have much time so we unfortunately had to make our visit to Nisonin super short. As luck would have it there was a long walkway and then quite a few stairs before the main temple. This path was nice enough though with overhanging trees lining the sides. Once we reached the top we had a quick look around the main buildings and were invited to take our shoes off to look inside the main hall. We could see a really nice looking garden in front of a sitting area inside but sadly had to turn down the monk’s offer as our train was due to depart in less than ten minutes! It was definitely time to start heading back! After walking back down the stairs we dashed out of the temple and sprinted back down to the Torokko Arashiyama train station. When we arrived everyone was already waiting on the platform so we hurried down as well. We were a bit disappointed that we didn't get to see everything at Nisonin as we missed the inside and a whole back section though, as Kate pointed, out we would not have been able to see anything if we hadn't visited at all. Not long after we arrived so did our train! It was old fashioned and quite a lot bigger than the Kurobe Gorge Scenic Railway we had experienced a few days ago near Toyama. Certainly it was smaller than a normal train though. Unlike the Kurobe Gorge railway, this train had assigned seats however once we got going most people (and there were a lot) stood up and moved around in order to better watch the scenery. The ride was very enjoyable and we had a great time watching the Hozu River roll past. Although it was spring a few trees were a nice orange colour- it would probably be really nice during the autumn colours season. The route we were following used to be part of the regular JR Sanin line however it was superseded in the late 1980's by faster trains running along a new and more direct line. Along the way we passed through a small station that had a lot of tanuki (racoon dog) statues; this was the same creature we had met at the Katchi Katchi ropeway in the Fuji 5 Lakes. As with all such tanuki statues they were somehow a little rude... I won't elaborate any further! If you're curious feel free to scrutinise the photo. Apart from the train it's also possible to ride a boat down the river and along the way we passed a group who were being manoeuvred around the rapids. After about twenty five minutes our trip was over and upon arriving at the final station the large crowd of people from our train quickly disappeared- probably to walk to the nearby JR station. The boats we had just seen left from around here (we thought) and although we were reasonably sure the last had already left Kate wanted to find the pier just in case. We really wanted to have a turn! So we went over to the river and had a bit of a search around but unfortunately couldn't find anything. 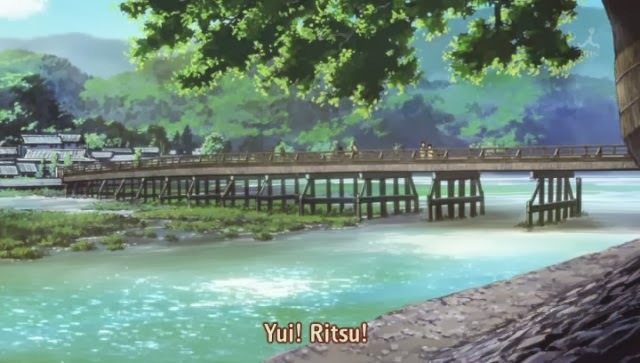 The boat pier is actually nowhere near this station and is located much further upstream. Anyway, since it was nearly five O'clock and there was nothing obvious around we figured it was all over so we started to walk down to the JR Umahori station. As we arrived at the station there were some announcements occurring in Japanese which caused us to rush over to our platform. As we passed through the gates we noticed that the times displayed were weird as they were for trains that should have already come. The platform was filled with an unusual number of people, the announcements continued and the time our train was supposed to arrive came and went. I tried listening to the announcements but I had some difficulties due to the poor audio quality, echoes and my dubious abilities. I could understand that there was a delay but I couldn't work out what actually happened or how long it would take to resolve. After a bit more waiting I gathered enough courage to ask an old lady waiting on the platform with her grandson. She explained that as there was some sort of signal delay further up the line all the trains in this direction had stopped and the next one was waiting at the previous station. I asked how long the delay would be but she said that no time frames had been given. We had a shinkansen to make! While we were wondering and investigating whether or not we should get a bus, the station master announced that the problems were solved and the train was on its way. A short while later a very crowded train arrived! By the way, I’m pretty sure this is the only time we have ever been affected by a delayed train in Japan. Anyway, thankfully we were somehow able to secure seats which was a great relief as each stop became more and more crowded. Not just crowded, we're talking white gloved station attendees physically pushing passages into the train crowded. So yay seat. Thanks to the delayed train it was an incredibly tight connection to the next shinkansen so once again we sprinted at great speed and somehow managed to make it over to our train in time. After arriving back at the hotel we had another look at the laundry room and decided to do some washing. The washing machines were reasonably large and for some reason I dumped heaps of clothes in- almost everything that I had previously worn. I had some trouble trying to work out how to use the coin operated machines as all the instructions were in Japanese but somehow managed to work it out. While it was washing we decided to both go back out and do some independent shopping. Kate wanted to have a look at the food level in the station and I was keen to explore the animate and Tora no Ana near Nagano station. Since we were going out separately and would not arrive back at the hotel at the same time we wanted to leave the single hotel key we had with the front desk. That way whoever got back first would be able to retrieve it and let themselves in. The guy was a bit strange though and seemed confused when I explained- though he accepted the key anyway. I think we also agreed to be back at the hotel by 8:30pm. Tonight was my second and final major manga shopping expedition on this trip and I once again bought a stack of books. I really wanted to get them second hand from Mandarake but as that ship had sailed, I had to make do with the premium prices at Animate instead. I had a look in Toranoana as well though it was mostly doujinshi- better to read the originals before any fan created works I thought. The shops shut at 8:30pm and I kept browsing right up until closing time! For this reason I neglected to get any food for dinner and despite running as fast as I could I arrived back at the hotel late! Poor Kate had been worrying about my whereabouts for the last 10 minutes! She actually suspected I might be late so had bought me some food and let me share one of the cakes she had bought! She also had gone down to the laundry room to transfer everything from the washing machine to dryer. We washed way too much stuff. I went down after another hour had passed and our clothes were nowhere near dry. To make matters worse there was only one dryer. To put things into disaster level there were two people waiting to use the dryer. One only had a minute to go on their machine, the other had about 20mins. To cut a long and stressfull story short, I look all my stuff out to let those two go ahead of us (they didn't have an unreasonable amount of clothes). I then took most of the heavier items and stuff we wouldn't be wearing for a while and we both hung as much of it as we could around the hotel. Then once everyone else had finished with the dryer I let the remainder of clothes spin for another hour. Lesson learnt! Go easy on the washing! It was really late at night by the time the second spin had finished, so I collapsed into bed and to sleep. Tommorow is our last in this region as we'll be travelling down to the town of Beppu in Kyushu, which was the only major Island we had yet to visit! That was in the afternoon/evening though; during the morning we were planned to travel over to the nearby city of Toyota for a Toyota factory tour! Or, are you considering visiting or have you recently travelled to Arashiyama in Kyoto? I like the blog overall, but generally a bit too wordy. More pictures would be better, even though there is plenty of detail! I constantly worry that I've write too much- I can't imagine anyone taking the time to read it. I'll definitely keep your comments in mind, I've been thinking about perhaps doing an abridged version. I can certainty include more photo's though- I took about 500 each day. I'll just have to work out how to get more in. I like how the detailed it is actually :) gives me a good idea of how to plan my itinerary and which spots I'm choosing to visit. Good work! This is great! I'm planning a trip at the moment so I love all the details and it's still an enjoyable read! So glad I found your blog.